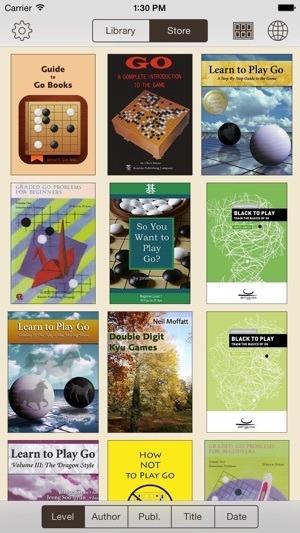 Enjoy high-quality books about the game of Go on your iPad and iPhone. Replay moves and solve problems directly within diagrams. A better experience than printed books, at half the price. - Free chapter for each book. - Play and replay moves in diagrams. - Text enhanced with inline diagrams. 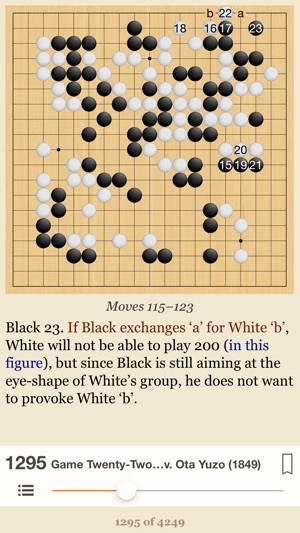 - Links to pro games in SmartGo Kifu. - Add your own notes anywhere in a book. - Adjustable font and layout. - Some multi-lingual books (Japanese, German, French & Spanish). - Buy once, read on iPad, iPhone, and Mac. 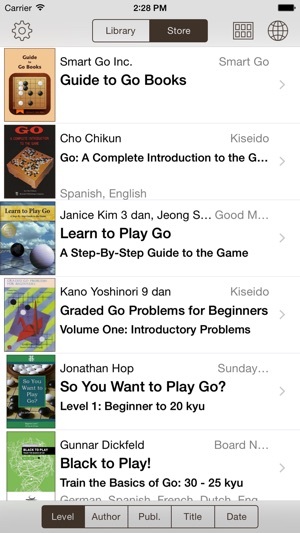 SmartGo Books currently offers more than 130 Go books that you can buy using in-app purchase; more books are in the works. To help you choose, the free “Guide to Go Books” provides clues as to which books might be appropriate for your level. For more than 20 years, the Elementary Go Series books have been the standard texts for Go players who want to get a firm grasp of the fundamentals. Not only is the theory of Go explained clearly and simply, the reader is also given problems to show how these theoretical concepts are applied in actual games. 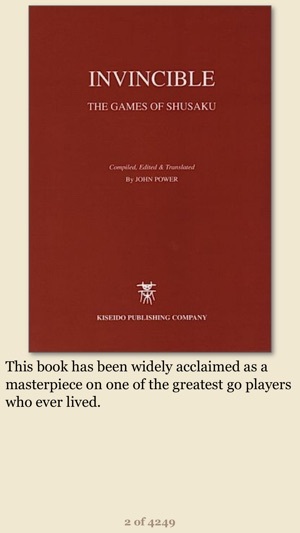 “Invincible: The Games of Shusaku” by John Power has been widely acclaimed as a masterpiece on one of the greatest Go players who ever lived. Enhanced with in-diagram replay, inline diagrams, and links to referenced games, be prepared to experience this classic in a whole new way. “The Life, Games and Commentaries of Honinbo Shuei” by John Fairbairn provides a full-length biography, detailed commentaries on 79 of Shuei's games tracing the development of Shuei's elusive style, and a collection of Shuei's commentaries. A must-read for every serious Go player and student of Go history. Update to look better on newest devices. The interactive diagrams make this way better and than using paper books and a physical go board. The ebooks in this app are also much cheaper than their paper counterparts - on the order of a third of the Amz prices. There's also a MacOS app that you can share your purchases to, although it doesn't sync your position (yet?). I realize that I'm not at a skill level to really push this Go engine too hard but I've played for several years and find this app to be at an excellent level for me. Unless I get a significant handicap, it can spank me. I'm looking forward to getting stronger; to fight back. The refresher problems help with making many tactical problems, that you end up seeing all the time in matches, more obvious. Also, the historical matches, which are somewhat commented on, are much easier to follow and watch unfold than in the Go books I have. Again, some folks probably can look at a page of numbered stones and see how it all came to end game, but for me, being able to move ahead move by move is a valuable tool. Finally, watching my 10yr old son and another adult friend of mine learn Go on this app makes me see the advantage it gives as a beginner teaching tool. Think of it as Kindle for your go books, only MUCH better. SmartGo Books brings true mobility to reading go books. It's easy enough to slip a go book into my purse, but when I hit the first diagram with more than a handful of numbered stones I wish I was sitting next to a real board with a set of stones so I can play out the diagram. My 7k brain just isn't capable of reading complicated diagrams without a real board. 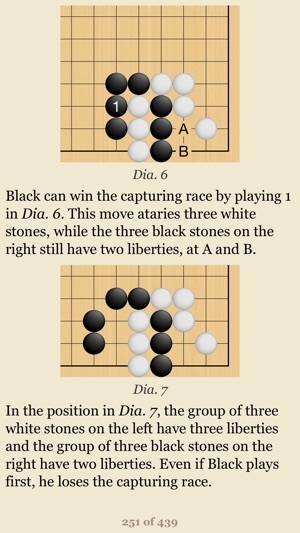 With SmartGo Books, however, I can see the stones appear on each diagram one stone at a time, so I don't need to be sitting next to a go board to fully appreciate the book. SmartGo Books on the iPad offers a sense of context by showing multiple diagrams with accompanying text. SmartGo Books for iPhone, while more compact, makes it possible to continue reading when it isn't convenient to carry the iPad. After using SmartGo Books I would never consider purchasing a digital copy of a go book in any other format if it were available as a SmartGo Book. I'm really hoping to see some of my favorite classic titles available soon. I'd be happy to repurchase the best of them so I could read them with SmartGo Books. This app is attractive, free, and easy to use. Every go player should have it. 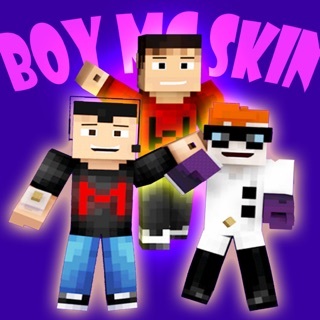 Download this app and read the samples to see for yourself how great it really is. © 2011 Smart Go, Inc.